* Other: we’re enamored with the originality of Piet’s beers. they’re not for everyone to be sure, but that’s kind of the point. in each of his beers, you’ll also find a bit of humor. "hik," means hiccups in Flemish. the drawing on the label is his 12-year old daughter’s – a bit dumbed-down for the U.S., where it’s not appropriate to depict a character under the influence of alcohol. This is another 12 percent import that I have been waiting to review. So far every thing that I have had from 12 percent imports has been exceptional. This is the first tasting of this bier. I can’t want to see what it’s like. Although I have seen this one at State Line for some time now, Frances my 8 year old daughter suggested it because of the smiley face. 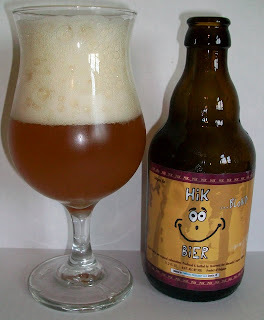 Review:The bier pours a hazy straw/blond color with almost orange hues and a bright white head. This bier is extremely carbonated. The head rose out of the bottle before I could start to pour it. (hence the wet label on the picture) Even after pouring there are a tremendous amount of tiny bubbles rising up from the bottom of the glass. The initial rich head dissipated fairly quickly but there is a nice thick protective layer over the top of the bier that is not going away. We are starting this one out around 50 degrees. The nose is very nice. Sweet almost caramel malt notes with a light flowing hop aroma and a touch of that Belgian yeastiness. This is very inviting and it’s a nice warm summer day, I can’t wait to dive into it. Very refreshing. I’ll take this over an American style summer ale any day. This is nice, really nice. It is clean crisp and refreshing with some natural citrus and light spice notes. This is just a good ole Belgian Blond. The taste starts out sweet and almost citrusy up front then a very pleasant and refreshing effervescence over the tongue in mid-sip. There is also a slight sourness building up toward the back end. This sourness is held at bay and is just a hint of the Flemish style. The back end is very easy to swallow; crisp and clean along with another release of the carbonation while going down. The combination also masks some of the flavors in the back-end. Not to worry, all the flavors a present on the finish. The finish is once again, clean crisp and refreshing. The is still that hint of a Flemish sour but just a hint, along with a very pleasant citrus note and a light hop dry finish. There is not much of a final aftertaste; some of the light hops are still there but with out any bitterness. There also continues to be some citrus and a touch of yeastiness. These final aftertaste flavors are very subtle; this bier has a very clean dry finish. This is extremely refreshing. If this was more easily available and the cost of Leffe I would make this my go to everyday Belgian Blond. In this case I am drinking faster than I’m typing so this may be a fairly short review. This bier is so refreshing I’m not wasting any time putting it away. The head has not quit and the lacing is pretty impressive for a blond. I gingerly poured the remainder into the glass as not to upset or pour in the lees. And there is still a great deal of sediment/floaters in the glass. The last bit of the glass is at 64 degrees. The effervescence has calmed down now and since it has warmed a little I’m picking up some more flavors. Well, they are not new flavors just more of them. The yeastiness and sourness are both more predominate now at this higher temperature. Don’t get me wrong this is still a very refreshing bier; it is just a little more yeasty now. This also could be from taking in more of the sediment/floaters toward the bottom of the glass. That also makes me want to try the lees on this one. Lees:Wow I got to get a picture of that. Look at the difference in color between the original bier and the lees. Now that is a little intimidating; I’m not a psyched as I was to tackle the lees on this one. I have never seen the lees change the color so much, these are really dark. OK, I’m going for it. Just don’t tell my better half, she does not appreciate the flatulence that comes with the lees. I started out with just a tiny sip and its bark is worse then its bite. These lees are actually pretty good. Let me get a better sip. Not bad but this still would have changed my original experience. These lees are not overpowering but still bitter and sourer enough to diminish the refreshing characteristics of this bier. Wow that final hit was a little much. I’m glad waited to try the lees separately. Final Thoughts:This is an excellent Blond. There is nothing unique or extreme about it. This bier is just exceptionally good. And for a blond that may be as good as it gets. I’m going or an A- on this one. I really don’t think you'll find a better representation of a straight up Belgian Blond. I highly recommend this bier to anyone that likes Belgian Blonds or anyone that is interested in the style. Like I said I you may not find a better representation of a good straight up Belgian Blond than this one. If I lived in Izegem, West Flanders, Belgium, this may very well be by everyday bier.